I wasn’t going to do the 12 Days of Christmas Gifts again last year. I really wasn’t. But then Jenna told me that she was doing it for Mark. Her ideas for Mark were SO GOOD, so I figured I would do it once again for Peter. 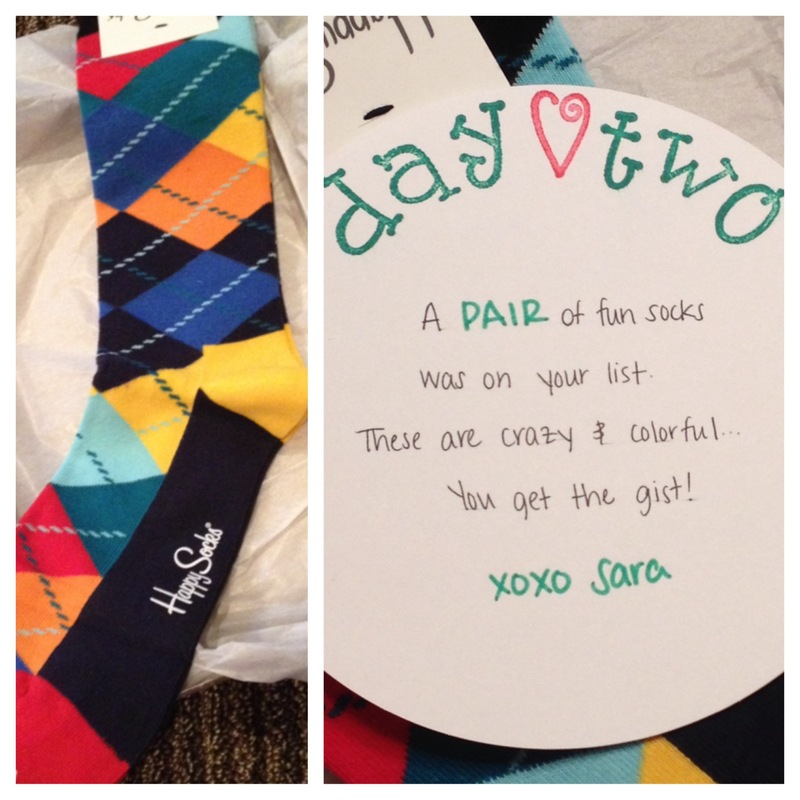 Honestly, if you are looking for a fun and creative gift, this is the way to go! 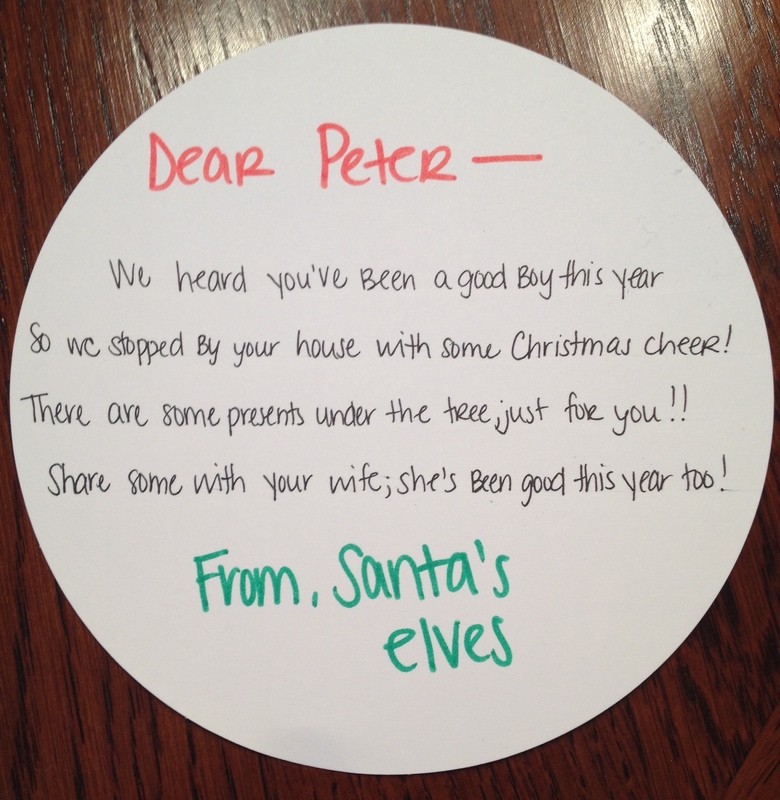 It’s so stressful and I actually thought about giving up MANY times much fun thinking of the gifts and little rhymes, and even more fun seeing Peter’s reactions to the gifts! Here are the 12 Days of Christmas Gifts from 2013. Last year I had to do it a little differently than the previous year because I knew that we would be out of town for almost half of the days; I knew that “hiding” the gifts would be a challenge. So, I decided to wrap all of them. And I don’t regret it because it turned out soooo cute. And I love wrapping gifts. Because all of the gifts were wrapped, I put all of them under the tree (save a couple that hadn’t been shipped to me yet) for him to see on Day 1. I left a note on our bedroom door for him to see when he woke up. I should bribe him with presents more often, because he’s never been voluntarily out of bed before 9 on a weekend until he saw this note! Item 1: Apologies for the poor iPhone photos. Eh. Item 2: I actually wrote the below portion of the post just after Christmas last year (I didn’t want to forget about my ideas! ), so that’s why it’s in the phase of life where we didn’t know if Daniel was a he or she and stuff. As you well know, we’re having a baby, and he or she is due at the end of May. I am totally picturing that Peter is going to be the kind of dad that tells dad jokes and shamelessly embarrasses his child. Therefore, this t-shirt is PERFECT. For all of the days, I put the note on top of the gift that was boxed and wrapped. 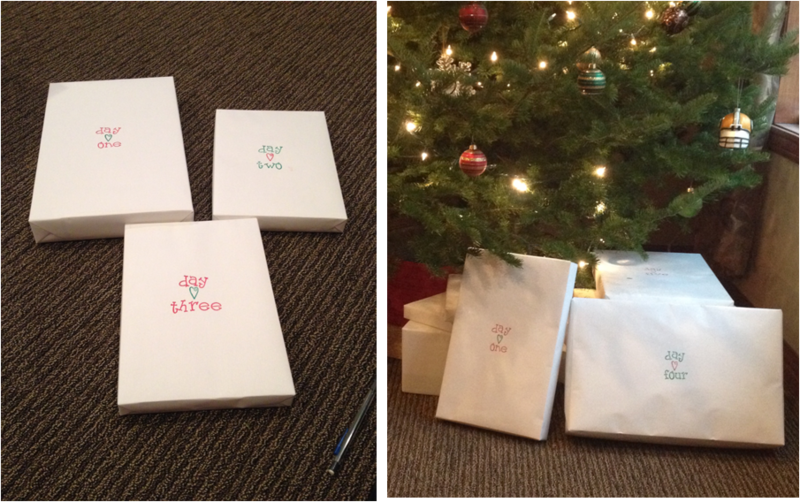 As you can see, I was MUCH more prepared this year, and had so much fun making all of the little notes and wrapping the gifts!! 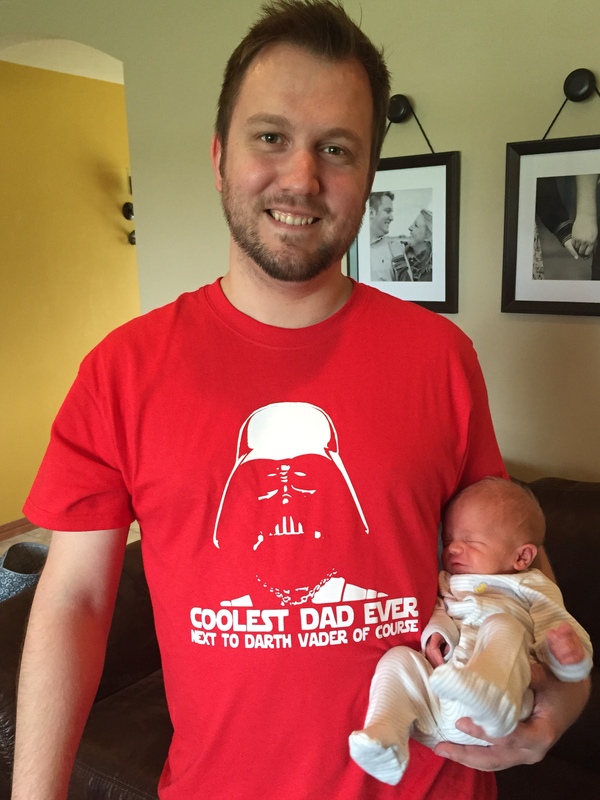 I just need to add in right now that Peter wore this t-shirt the day we brought Daniel home from the hospital. OMGGGGGGG look at how tiny my little pookie head is!!! Creative, I know. Seriously though, Pete has asked a couple of times for “fun bid-ness socks”. A month or so ago, Peter asked me to get this book for him on my old Kindle that he uses. I never did because I forgot, and then when I was brainstorming gifts to give him, I remembered! They didn’t have the book available for a Kindle though, so I got him the actual thing. He tends to prefer hard-copy anyways so he can write on the pages and stuff. I am a sucker for a cozy throw blanket, so this gift served both of us well. I wanted to get him something from St. Norbert College, and decided to do it on day 4 since he graduated 4 years ago. Peter LOVES meatballs. They’re his favorite meal. Unfortunately, his wife does NOT love dealing with raw meat to the extent that is needed to make meatballs. So, although it’s his favorite meal in the world, I make it MAYBE three times a year. We had planned to go bowling with his coworkers at the beginning of December, so I was kind of like UGH NO because it ruined the gift day. And then, after this was wrapped, we made plans with our neighbors to get dinner the next night, so we are planning on having the meatballs sometime shortly after Christmas. 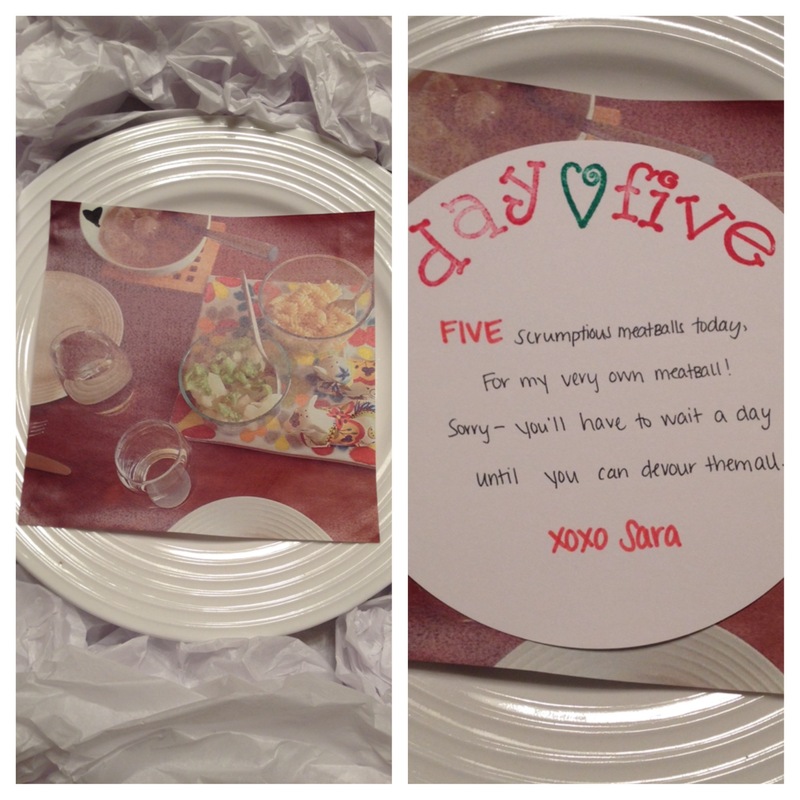 Since I couldn’t really wrap the meatballs… I wrapped a plate with a picture of the meal on it. The meatballs aren’t the star of the picture… but he got the point! He was very happy with this gift. This was a repeat gift, but who cares. He sure didn’t! I FINALLY FOUND ONE. 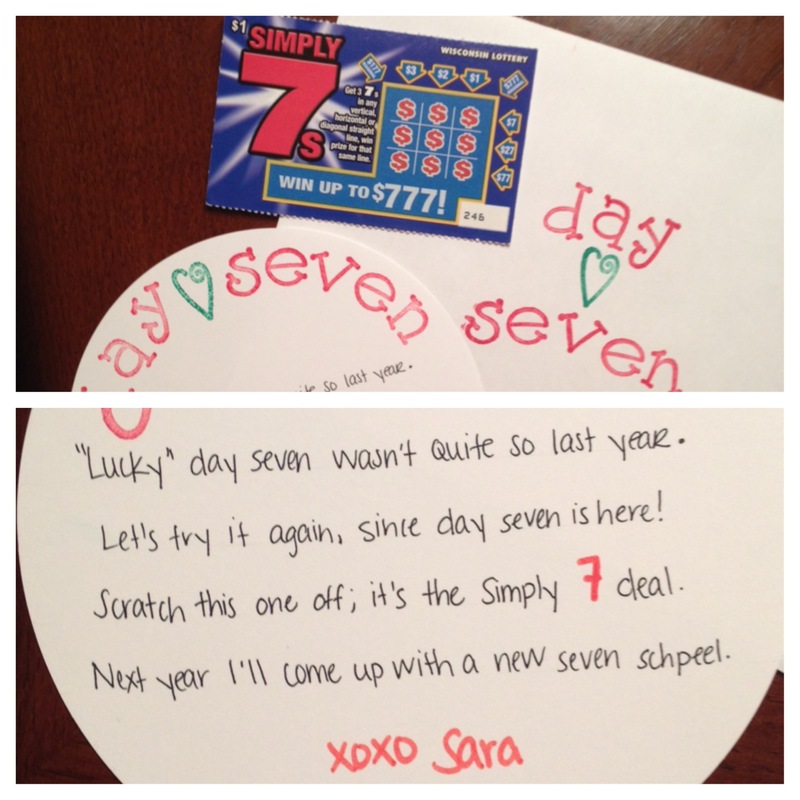 Also a repeat, but I FOUND A LOTTO TICKET WITH THE NUMBER 7 IN IT. I was sooooo happy. Instead of wrapping this gift, I put it in an envelope. 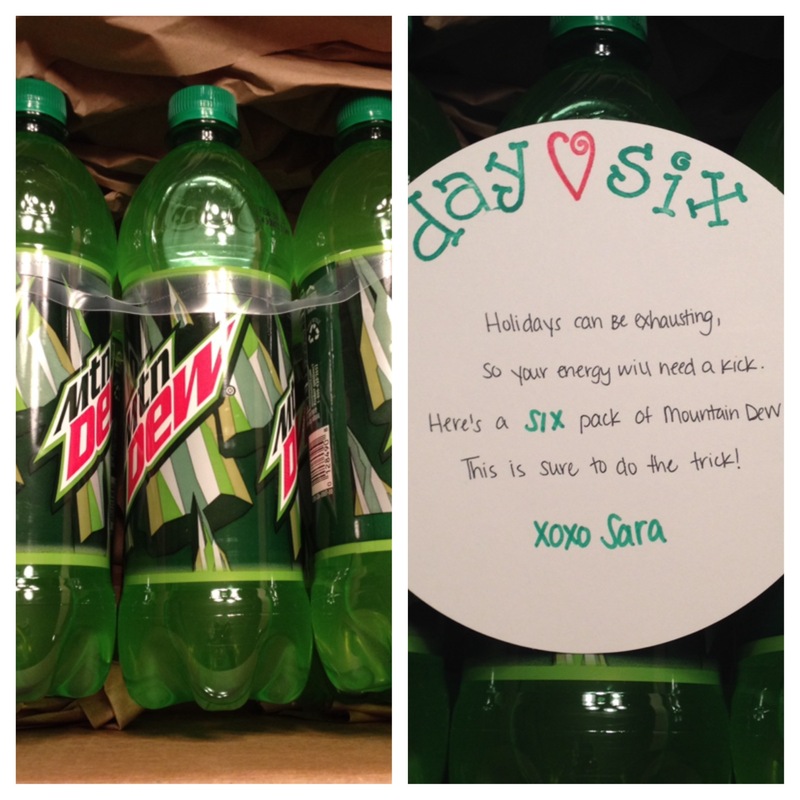 I loved that I was using different sized packages for the 12 different days! I’m not sure if many of you remember the first time I bought Peter a Jordy Nelson jersey, but to say that it was a disaster is an understatement. The jersey I bought him almost 4 years ago now has really gotten worn down. One of the “N”s is almost completely off. I decided that this would be his big gift for the year. This time was much more of a challenge, but it all worked out in the end. Not without gallons of sweat and a couple of tears though. Blood too, if you count my nosebleed (which I do). I thought that I was really on top of my game, ordering the jersey before Thanksgiving. Turns out that the nice jersey that I wanted is one that everyone else wants too, and all stores are SOLD OUT of them until THE MIDDLE OF JANUARY. I ended up finding this sketchy Chinese website that assured 100% quality and prompt shipping in 7-10 business days. And the letters/numbers were embroidered on, and it was HALF THE COST of what the jersey would cost at the Packers Pro Shop. I was pretty nervous about this purchase, especially after reading “We wish you enjoy your shopping time at our Packers Club!” on their website (that is a direct copy/paste…). 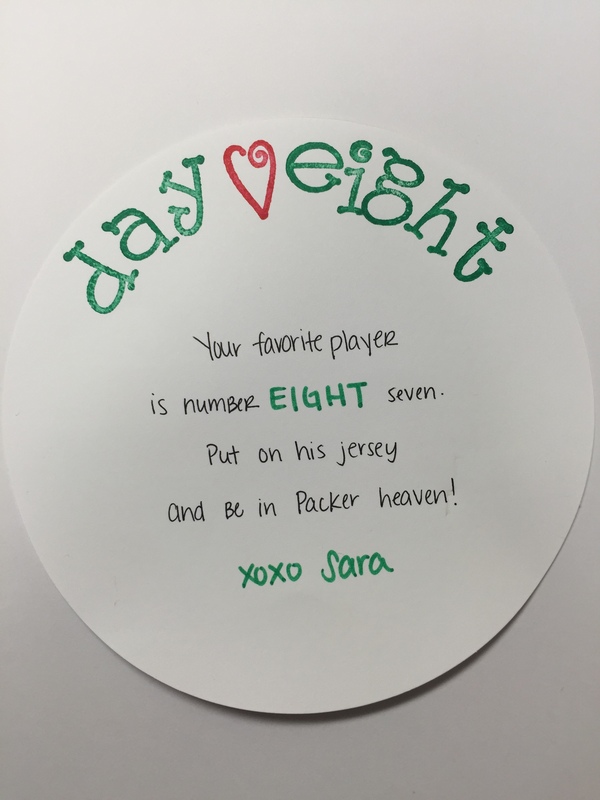 From Sara, To China: Hello – On November 24, I ordered a Jordy Nelson jersey (#87) and I have not received any email confirmations or shipping notification. Will the jersey be delivered soon? It is order number 20141124553463. Thank you! From Sara, To China: Thank you for emailing me back. Will the order go through?? Why did it fail???? 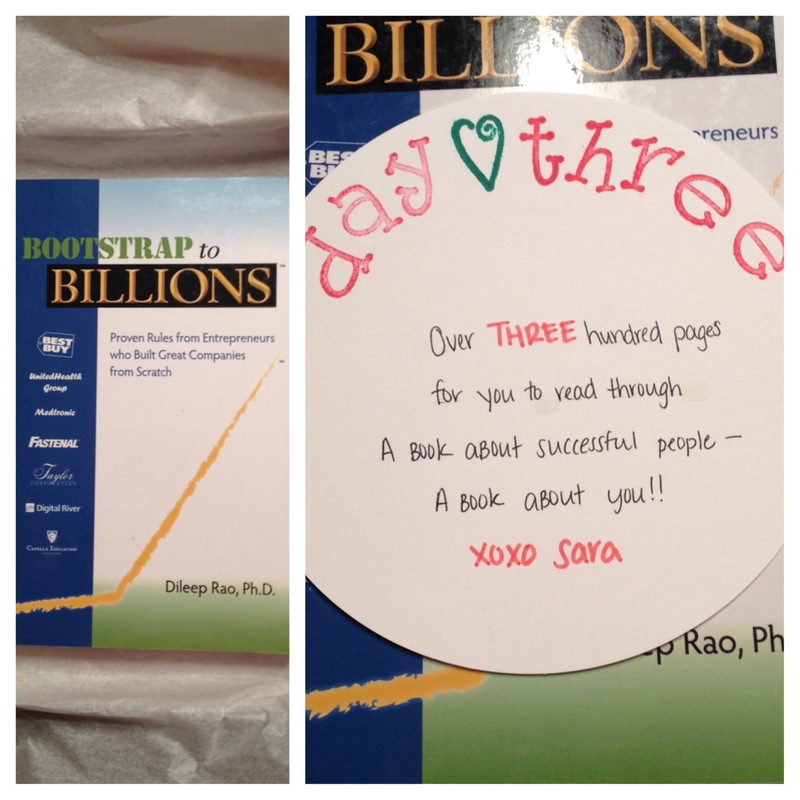 From Sara, To China: Why didn’t I receive an email about this when I ordered? Is everything cancelled? From China, To Sara: If your order not go through then you will not received the confirmation email. And then I gave up. I started searching in the greater Green Bay area, La Crosse area (Taylor goes to school there), and finally Milwaukee. After calling 12 stores with no luck, I called Finish Line in Milwaukee, talked to a wonderful man, and begged him to hold the jersey for me for 5 days, when usually they only hold things for one. He was very willing to help me, and I could have hugged him through the phone. Marty’s girlfriend Kathleen picked up the jersey for me, so I hauled all of my wrapping stuff to Lake Geneva and wrapped everything up on the 20th. Peter is lucky I’m such a determined woman. It recently came to my attention that some of Peter’s white t-shirts were a little too small. And they are OLD. When I asked him why he didn’t tell me that his shirts were too small, he said that he didn’t want to get them for Christmas. TOO BAD!!! 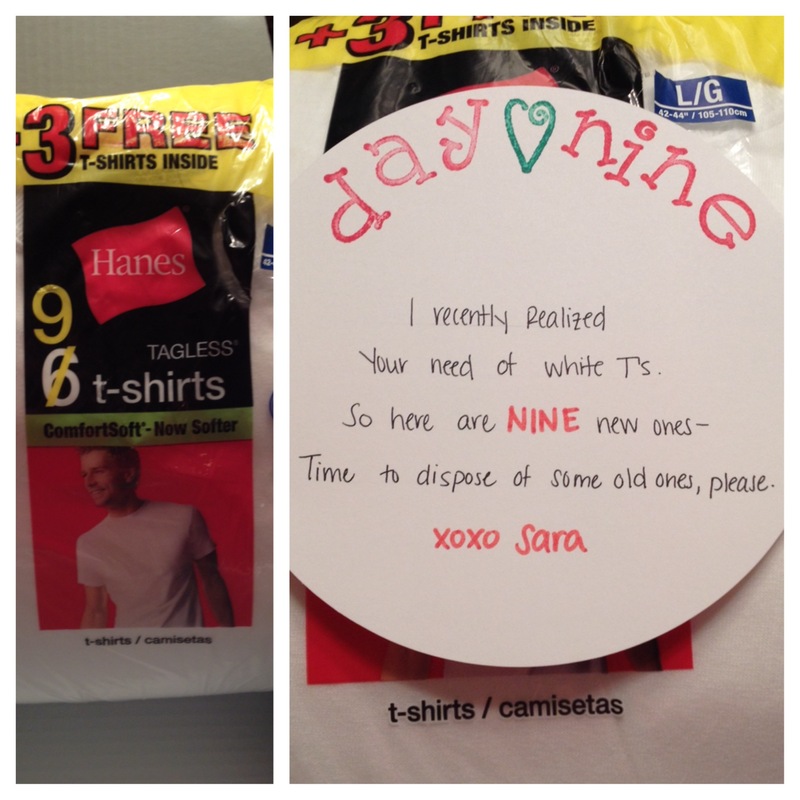 9 was the number that I had a lot of trouble thinking of (and 11), so I decided to do the t-shirts on this day. It ended up working PERFECTLY because by some fluke I actually found a NINE PACK of t-shirts. The odds were ever in my favor. We’re huge nerds, and I am not afraid to admit it. I am heavily invested in the series of Game of Thrones books that I bought Pete last year for Christmas (he still hasn’t read beyond the first one…), and we borrowed the first 2 seasons of the show from our neighbors. Instead of spending big bucks to buy season 3, I checked it out from the library. One of my more brilliant plans, if I do say so myself. 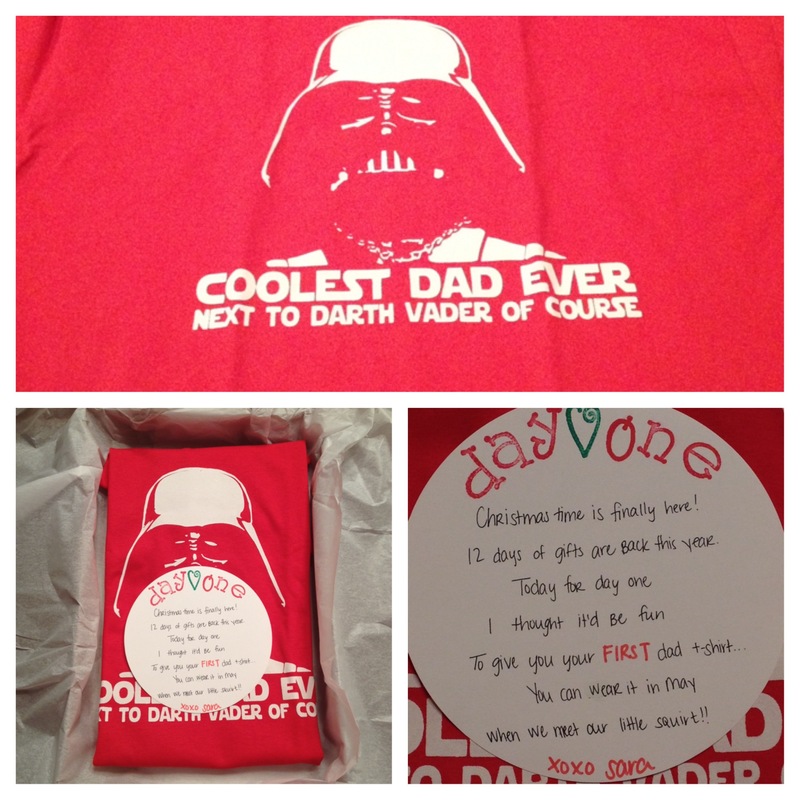 … until I didn’t put the hold on soon enough, so didn’t have the DVDs in hand to wrap up. Instead I put a picture of the DVDs in an envelope with the note. Ten episodes in season 3. The bottle of wine is Parallel 44 Frozen Tundra Red. If you like sweet reds… This wine is for you! I know that this doesn’t correspond with the day, but seriously YOU try thinking of 11 somethings. My favorite wine on day 11. Sipping this would be a taste of heaven! I had kind of a hard time thinking of a day 12 gift this year. Last year’s watch was perfect, and I had already done the big gift on day 8 so…. Michelle was the brains behind this one (rhyme included! ), and I am very grateful. After the 12 months of next year. 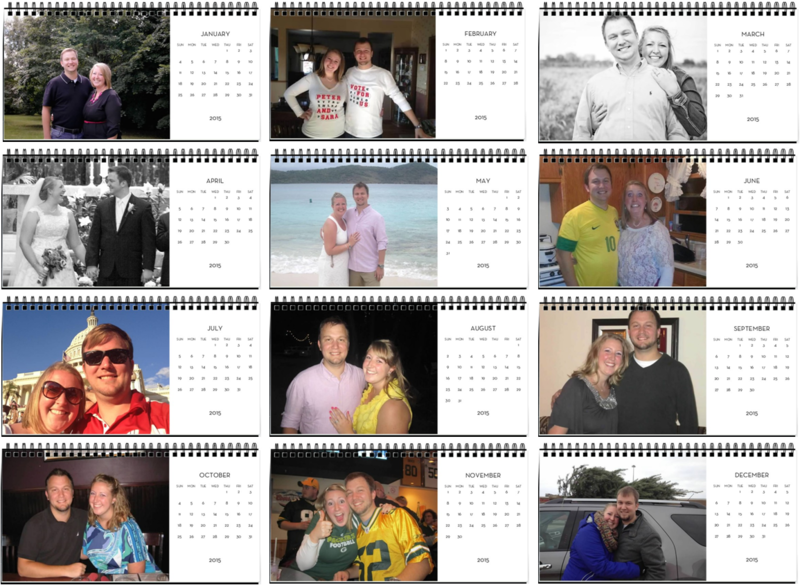 When I told Jenna about the calendar, she said, “You’re only doing pictures of you and Peter? ?” Girl’s gotta do what a girl’s gotta do. After May he’ll have a cute little baby he’ll want to look at all the time, so I’m trying to make sure he looks at the person who carried the child for 9 months once in a while.